The Stallions are on the charge. As the hipsters gather round their heptagon-shaped table to collate their predictions for upcoming international tournaments, at the top of the agenda lies who will be allocated the “dark horse” title. Ignoring those with the shortest odds and the hosts of said tournament, they skip to the middle ground and look at the contenders, to decide which country will surprise pundits and fans alike. For the 2013 Africa Cup of Nations, it was the Democratic Republic of Congo who many decided on. However, despite the incredible exploits of Diermerci Mbokani in front of goal for Anderlecht this season, and wide array of players they’ve mostly heard of, the hipster choice was eliminated in the group stage. Emergency meeting was held. A new dark horse was decided. Burkina Faso. Known as The Stallions (making them almost literally dark horses for this tournament), Burkina Faso well and truly gazumped everyone else in their group, who would have pencilled this one in as a guaranteed 3 points. Getting a draw against AFCON veterans Nigeria and current holders Zambia, they gave viewers of the competition a much-needed dose of goalage, thumping minnows Ethiopia 4-0 to provide the most comprehensive performance of any team so far, in a group stage where balls hitting the back of the net had been relatively scarce. Topping their group, they will face a Togo side in Nelspruit on the 3rd of February which they will most certainly fancy their chances against, meaning they could potentially reach the semi-finals without too much trouble – a big deal for the Burkinabe national team. 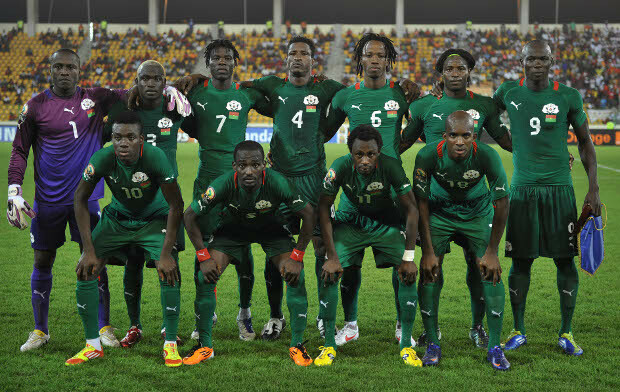 History of their participation in international tournaments certainly did not back them up pre-AFCON 2013. They have never qualified for a world cup, and have only got past the first round of AFCON once in their history, when they reached the semi-finals when they hosted the competition in 1998 (and which AFCON having the highest proportion success for the hosts out of any other regional international tournament, this was hardly a surprise). But now, under the guidance of head coach Paul Put, they are the outsider’s choice for the title, if they defy the odds in a Zambia-esque fashion to lift the trophy. As for the squad of players they can, they have been recruited from all over the world, offering a diverse set of leagues they spent most of the year playing in. From France to Moldova, Ghana to Qatar, the team has been plucked from places far and wide, but it is a more familiar league that their main man comes from. Alain Traore, once on trial at Manchester United and having impressed greatly for Lorient after a summer move from Auxerre, is currently the tournament’s top scorer going into the quarter-final stage. Scoring a late-equaliser against Nigeria and a brace during the demolition of Ethiopia, he has been baring many points for AFCON fantasy football partakers all over the world, and Burkina Faso fans will be hoping he can continue to propel his team forward into the latter stages. And with Rennes winger Jonathan Pitroipa providing him ammo from the wing and Lyon defender Bakary Kone stabilising things at the back, there will be a Ligue 1 flavour to any success that comes the Stallions way. Whilst everyone is focusing on the Cape Verde story (rightly so, I may add), a bit of time has to go to Burkina Faso considering their record in the tournament, and the fact they have provided a certain spice to a relatively drab competition lacking in goals. And if you’re the kind of person who fancies a flutter, the Stallions don’t look like the worse bet in the world, that’s for sure.